Thanks so much to everyone who voted for me – you rock! And I’m stoked to be representing Cape Town and the erm, “veteran” age group. But a photo shoot? This is like my worst nightmare just came true. Gulp. And speaking of hair, I should probably organise my annual trip to the hairdresser. Pronto. 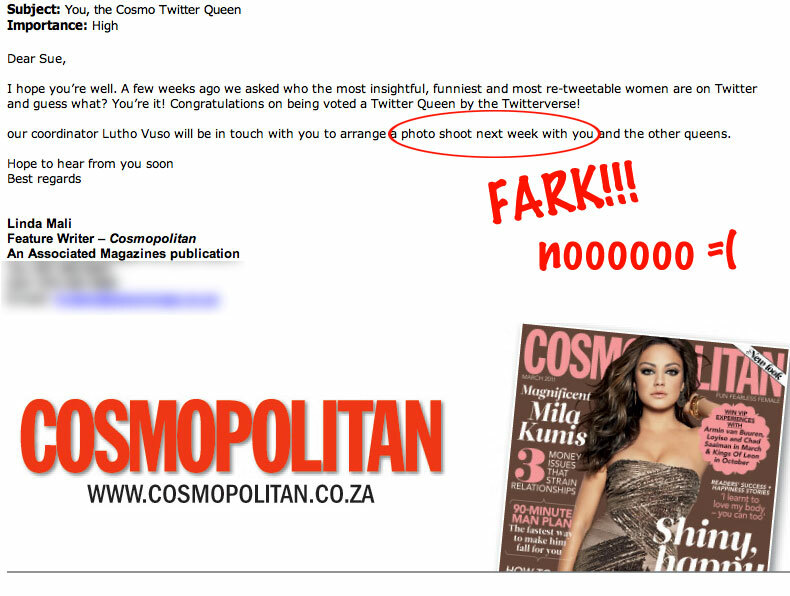 Awesomeeeeeeee, you’re so beautiful, can’t wait to see the pics – you’ll def be the best looking, I dont buy Cosmo every month so please do a blog post with which month it will be in so I can get it. Can’t wait to see the pics and publish them on iMod saying.. MY BOSS ROCKS! No man, you don’t understand lol! Awesome-tastic! And once they see how gawjiss you are they will make you Twitter Queen of the world!! What awesome news! And there is no need to be concerned about a photo-shoot, you’re absolutely, drop-dead gorgeous! i totally understand the photophobia btw. i has it, big time!